I think it's so fun to see all the mosaics popping up with projects for the year. It's really satisfying/amazing to see what has been created this year. I've come down with a nasty stomach bug and am pretty well stuck on the couch, so what better time to put this year end post together. We definitely won't be partying this evening. Currently saltines and gatorade are the only things that sound good. All my quilts for the year, including a few of my favorite quilt backs. Other sewing projects and bee blocks I put together this year. Oof, sorry about the stomach bug! Hope you're feeling better soon. 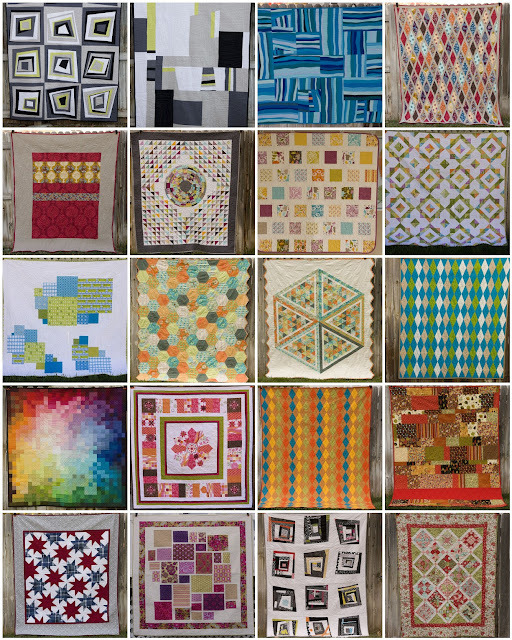 Your quilts are truly some of my favorites I've seen this year. The pixelated color wheel is the coolest. Truely lovely stuff you create! And all very different in pattern and colours, I think. Thak you for sharing and blogging, I really enjoy having you in my reader and participate in your swaps!! We're sick too! :( Beautiful projects! Looking forward to seeing what you come up with next year as well. Gorgeous mosaic, I've been lurking all year admiring your beautiful makes! Wow, what a great collection of makes. Hope you're feeling much better soon, and happy new year! Hope you are feeling better soon. Such gorgeous works this year. Happy New Year! Happy New Year to you, Kati, and may it be healthy, happy and productive! and hope you are feeling better and back in action soon! Oh I`ve been sick since Christmas too - isn`t it miserable? Love your makes as ever Kati - wishing you good health soon. Lovely! I hope you're back up and around quickly! So glad to have 'made your acquaintance' in the last year! Hope 2012 sees you feeling better - and you get to make and do everything you hope to. What gorgeous quilts, Kati! Happy new year - hope you're feeling better! What an amazing year. Thanks for being such an inspiration, Kati!